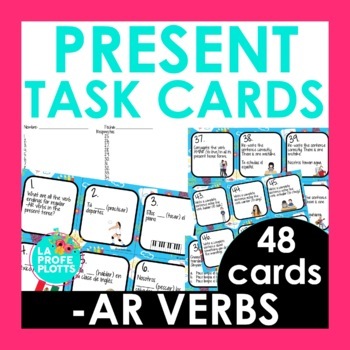 This present tense task card set has 48 different cards with a variety of tasks, not just fill in the blank sentences. 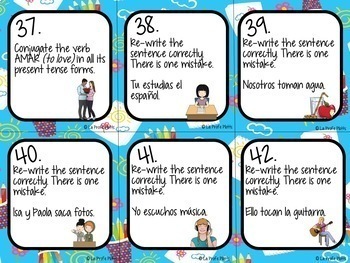 Your students will receive a well-rounded review of regular -AR verbs in el presente. Students will be engaged as they complete various tasks on the included response sheet like conjugating -AR verbs in the present tense, filling in the blank with the correct present tense form of the -AR verb in parentheses, rewriting incorrect sentences correctly, writing complete sentences from prompts given, and answering multiple choice questions about translations of sentences. Check out the thumbnails and preview for a sampling of cards/materials included with this set. There are TWO versions included with this zip file: one with the colored background in the preview and another more ink-friendly version that has a plain white background for all the task cards. 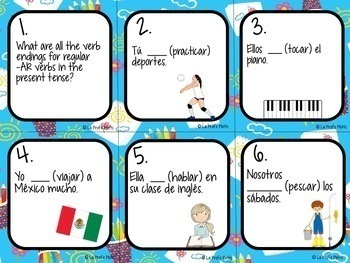 Present tense task cards can be used in many different ways! The possibilities are endless! 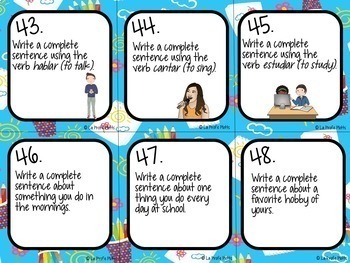 Instructions for seven of my favorite ways to use task cards in class are included! Need another engaging present tense product? Click HERE to see the other present tense products in my store like the super fun ¡Cucharas! Spoons Game for Present Tense of Regular -AR Verbs!